These three handsome guys are our nephew's. Above are the two sons of Tara's sister. Aidan is 3.5 and Porter is 7 months. Below is the son of Troy's brother. 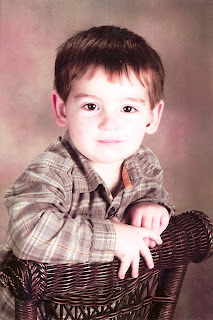 Joshua is 2 and will become a big brother late this summer. All these little guys live in Minnesota. 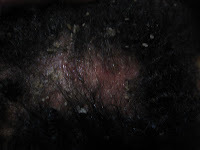 This is a photo of Phoebe's scalp. Did I mention I am discouraged about this? So far the Melaleuca Oil (Tea Tree) is drying it out but she seems not to have any relief from the itching. The itching seems to get worse as the day goes on. We give her Benedryl at night to help her sleep. Underneath the dried up parts it is still sort of seeping and I don't really see much improvement yet. I'm not sure how long I should wait before I give up and try the next treatment option. I am posting this hoping to confirm with Jen and other Docs who are in the know that this is ringworm and that we should keep doing what we're doing for her. I better go. Lots to do and no time to waste. Happy President's Day, Nephew Day, and Carnival.